If you love the flavor of Thai peanut satay then you'll flip for these marinated grilled shrimp skewers. These are marinated in a special Thai seasoning and the flavors are really soaked up quickly. Once these are grilled then either dip them in the Thai Peanut sauce recipe (it's repeated below for convenience) or just drizzle it over them before serving. 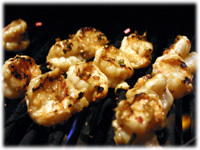 One of the secrets to success with most shrimp grilling recipes is to have a very hot grill and cook them quickly. Shrimp don't need much time on the grill, perhaps 6 - 8 minutes total depending on the heat and the size of the shrimp. These marinated grill shrimp make a great BBQ side dish or a spicy shrimp appetizer. Variation: If you choose smaller shrimp you will be able to produce more skewers and feed more people. 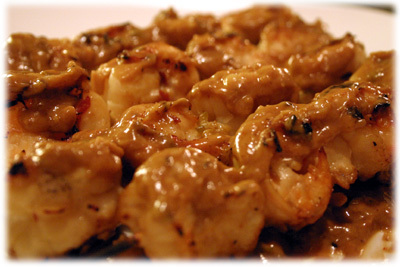 Place the raw, shelled and deveined shrimp in a plastic resealable bag and pour in the marinade. Seal and refrigerate for 60 minutes. Too long and the shrimp will start to "cook" in the acid. 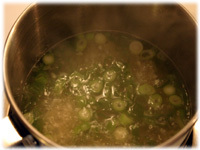 In a medium saucepan add the chicken broth and bring to a gentle boil. 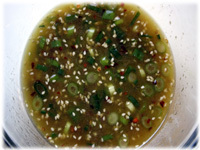 Reduce the heat to a simmer and add the green onion and garlic. Simmer for several minutes until the onion begins to soften. 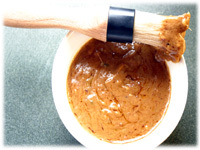 Combine the remaining peanut sauce ingredients and stir well until there's no oil separation. Keep covered and warm until ready to use. Clean and oil the grates of the grill and preheat to 575F - 600F. If using the large jumbo shrimp thread 4 on each pre-soaked bamboo skewers. 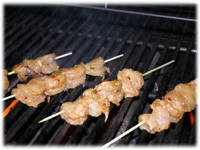 Place the skewers on the hot grill and close the lid. After 3 - 4 minutes lift the lid, wiggle the marinated grilled shrimp skewers with your tongs, flip them over and close the lid for 3 - 4 minutes. You should be seeing nice grill marks and they should be turning pink and opaque. When the 3 - 4 minutes is up, lift the lid and remove the grilled shrimp to a serving platter. 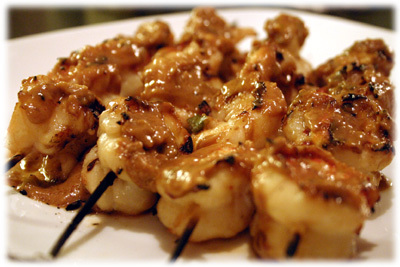 Either drizzle the warm peanut sauce over the marinated shrimp skewers or serve on the side as a dipping sauce.